These are some of the most frequently asked questions we receive from our customers when inquiring about Cold Fire Creek Dogsled Tours. Q: Where is Cold Fire Creek Dogsledding? 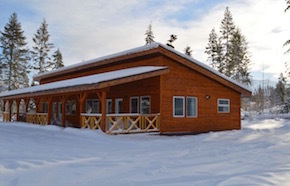 A: Our kennel is situated between Tete Jeune Cache, BC and McBride BC off Hwy16 west. We are 120kms from Jasper Alberta, past Mt. 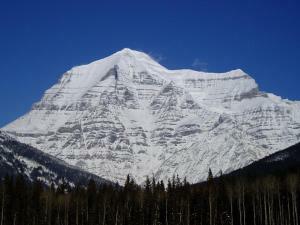 Robson - highest peak in the Canadian Rockies. Q: What kind of dogs do you use? 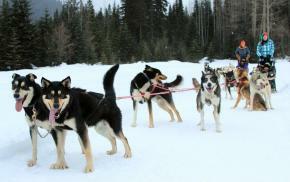 A: We us mostly Alaskan Huskies for our dog sled excursions. 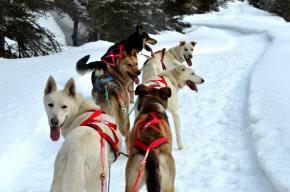 They are fast, light weight 40-70lb old breed huskies and husky-hound crosses. Q: Can we pet the dogs? A: By all means, that’s why they are here! 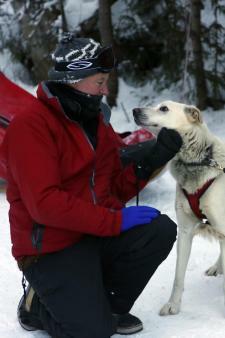 Our sled dogs run because of the love and affection they receive. But if you pet one, you have to pet them all! Q: How many dogs on each team? A: It all depends on snow conditions. 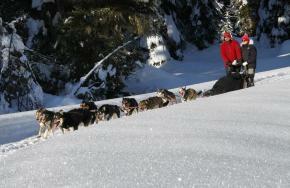 In the early season when we receive lots of snow, the trail is heavy and we require 8 dogs. In January when the temperature drops and the snow falls are less frequent, the trail becomes hard and fast. It’s at this time that we only require 6 dogs to do the same job. Q: Can anyone drive the sled? A: As long as you are heavy enough to stop and hold the team, you qualify. If you are not you have the option to drive tandem with an instructor so you too can experience the back of the sled. If you do not want to drive, that’s okay. We need passengers too! Q: How many people per sled? A: The guided sleds have 3 (2 guests/1 guide) The Rookie sleds in which guests are driving their own team are typically 2, but you can have a family of 1 or 2 children with 1 or 2 adults, or rarely a group of 3 adults. It really depends on weight. 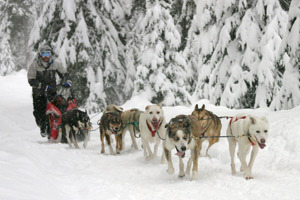 The average sled carries 500lbs. Q: How many people and sleds on one tour? A: We operate 6 teams of dogs at one time and usually run 2 people per sled (unless there are children then we can have more), so 12 people on one tour. Nice and small to keep things personal. We represent Quality not Quantity! Q: Do you need to be physically fit? A: To drive - somewhat. To ride - No. We have had guests as old as 92 and as young as 15 days old. Women expecting and people with disabilities are also welcome. Just let us know when booking your tour so we can accommodate you appropriately. Q: What is the trail like? A: We follow an old trap line which was established over 100 years ago. Its winding path follows the Small River drainage to its headwaters. 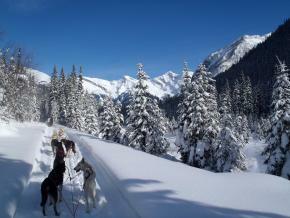 It is very scenic with vast mountain peaks, snow laden timbers, frozen waterfalls, and icy waters. We basically are heading up into a mountain valley. Some places are narrow with timbers. Others are wide open with outstanding panoramic views. Q: What do you provide with the campfire lunch? A: Lunch includes: campfire cooked Valbella sausages on cheese buns, homemade loaves and cookies, trail mixes, fresh fruit and hot apple cider. Vegetarian lunch on request. A: You want to dress as you would to go skiing. It’s always best to dress in layers under your ski pants and jacket. Those that are driving may work up a sweat and may want to shed a layer, while those that are riding will need an extra one. We do have blankets that line the sleds for your comfort and warmth. Proper winter boots, hats and mitts are a necessity. You may also wish to bring eye wear as depending on trail conditions the dogs may kick back snow. Q: Can we bring our video camera? A: Yes. You cannot forget your cameras. How do you think we got all these photos ~ from our guests mostly! You have to capture all those magic moments some how. There is also enough room in the sleds for you to bring a small pack with any extra gear you may need. Q: What do you recommend for accommodations? A: We recommend Mica Mountain Lodge. It is located just 10 minutes from us. Unwind and have fun at a unique getaway. 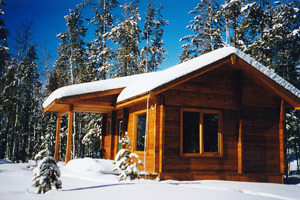 A: We also recommend Willow Ranch Valemount.